This report presents information on abuses in Nyaunglebin District for the period of April to July 2009. Though Nyaunglebin saw a reduction in SPDC activities during the first six months of 2009, patrols resumed in July. Since then, IDP villagers attempting to evade SPDC control report that they have subsequently been unable to regularly access farm fields or gardens, exacerbating cycles of food shortages set in motion by the northern Karen State offensive which began in 2006. Other villagers, from the only nominally controlled villages in the Nyaunglebin's eastern hills to SPDC-administered relocation sites in the west, meanwhile, report abuses including forced labour, conscription into government militia, travel restrictions and the torture of two village leaders for alleged contact with the KNLA. The Burma Army presence in upland areas of Nyaunglebin District during 2009 has remained markedly smaller than at any time since the start of 2006. 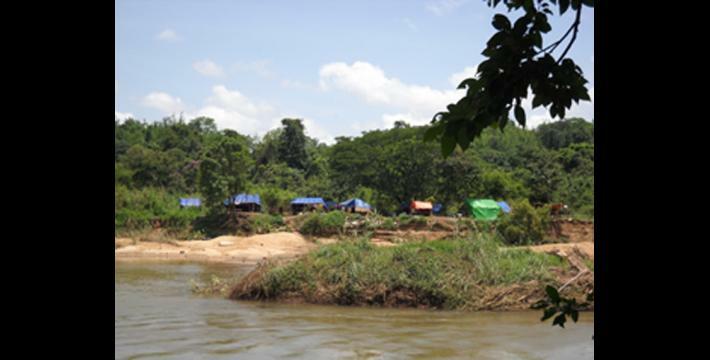 At that time (February 2006), the Burma Army began investing extensive resources into consolidating control of the area as part of a wider offensive in northern Karen State, which had begun in Toungoo District in late 2005. More recently, Nyaunglebin District, like Papun District to the east, has seen a reduction of Burma Army operations in some areas. In December 2008, Light Infantry Division (LID) #101 was replaced by Military Operations Command (MOC) #1 and, for the first six months of 2009, many of the frontline positions once occupied by LID #101 remained empty; MOC #1 mostly confined its operations to areas near major roads in Nyaunglebin's northern and central Kyauk Kyi and Mone townships. In western Nyaunglebin District, an area made up mostly of flat plains, State Peace and Development Council (SPDC) control is at its apex. In this area, as this report will show, abuses including forced relocation, forced recruitment into SPDC 'pyithusit' militia, forced labour on military camps, arbitrary 'taxation,' commandeering of agricultural equipment and demands for food and alcohol are pervasive. The degree to which the SPDC controls the rest of Nyaunglebin, however, is best understood as shades varying on a gradient between the "white" government-controlled plains areas in the west and, in the hills to the east, "brown" areas contested by the Karen National Liberation Army (KNLA). In these "brown" areas, as this report documents, abuses are similar to those faced by villagers in "white" areas of consolidated SPDC control, but also include violent retribution for KNLA attacks and requirements to stand sentry outside villages. Villagers attempting to avoid SPDC control by going into hiding, meanwhile, are facing severe food shortages as resumed patrols by the Burma army and its shoot-on-site policy limit secure access to farm fields and gardens. 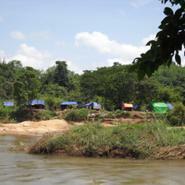 The KNLA's 3rd Brigade continues to be active in eastern Nyaunglebin District, though clashes in 2009 were limited. During this time, KNLA soldiers deployed landmines and conducted ambushes on Burma Army patrols. In response, SPDC soldiers conducted reprisals against local villagers. On April 10th 2009, for instance, a supply truck belonging to SPDC MOC #5, based in adjacent Toungoo District, drove over and detonated a landmine on the vehicle road near Gk'moo Loh village tract in Mone Township of northern Nyaunglebin District. Following the incident, Burma Army soldiers arrested the village head and village secretary from Gk'Moo Loh village. According to KHRG field researchers, Burma Army soldiers accused the two men of having contacts with the KNLA, who they blamed for the attack on the supply truck. The soldiers then ordered the villagers to provide details of the locations of nearby KNLA camps. 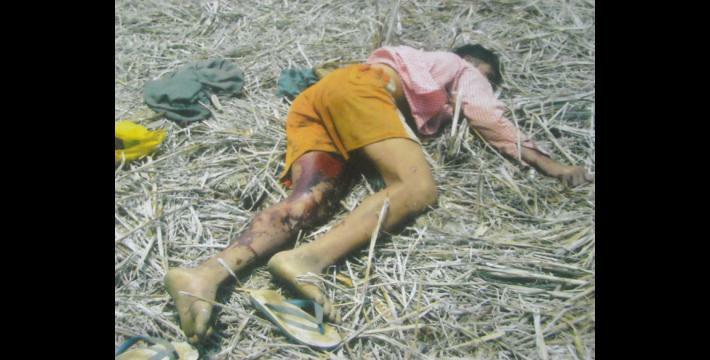 During the interrogation, Burma Army soldiers beat the two men and scalded them with pots of boiling water. When they still could not provide any information about the KNLA, Burma Army soldiers demanded that the other residents of Gk'Moo Loh village show them the locations of KNLA camps in the area. The soldiers threatened that if the villagers could not or would not provide this information, the two men would be put inside one of their houses, which would then be set on fire. However, as the villagers did not know the locations of any KNLA positions in the area, they could not provide the requisite information. 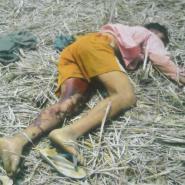 Despite the soldiers' threats and the villagers' inability to provide information, the Burma Army soldiers did not carry out their threat to burn the men alive. In July 2009, MOC #1 and MOC #5 began more frequently patrolling areas in northern Mone Township, including around the Gkwee Doh Koh, Nya Muh Kee, Gk'Bpa Htan Nwah Lay Koh and Gkyaw Pya village tracts. The area is home to large numbers of internally displaced people (IDPs), who have attempted to avoid abuse by going into hiding or staying in villages outside of SPDC control. The increased Burma Army activity in the area is creating intense difficulties for these villagers, who are deemed KNLA supporters and shot if encountered by SPDC patrols. Villagers in areas near new army camps or active patrols have had to flee their homes, leaving behind food and belongings. These villagers are also now unable to regularly access their paddy fields and vegetable gardens. Left unattended, their crops are vulnerable to wild animals, insects, flooding and weeds. Though villagers attempt to cultivate their crops despite the risk of being shot by SPDC patrols, the difficulty of accessing their fields due to the increased presence of the Burma Army has contributed to severe food shortages in the area. Schools operated by the local community in Nya Muh Kee, Gk'Bpa Hta and Nwah Lay Koh villages have also been closed because of the renewed risk of shelling or ground attack by SPDC patrols. People remaining in their villages, meanwhile, are facing SPDC-imposed travel restrictions that also limit their ability to access farms and workplaces. Villagers are on a 6:00 pm to 6:00 am curfew. However, even during the daytime when they are technically allowed to travel outside of their villages, they are required to purchase travel permits if and when they wish to leave their village. People caught away from their villages without a permit or during curfew risk being fined, arrested or shot. On June 9th 2009, a group of soldiers from SPDC Light Infantry Battalion (LIB) #590 patrolling near Bpaw Bpee Der village encountered Saw M---. Though other villagers in the area report that Saw M--- was only outside of the village to work on his farm, he was shot and killed by soldiers of LIB #590. Two days later, on June 11th, troops from Infantry Battalion (IB) #53, lead by officer Min Thoo, entered Bpaw Bpee Der village and forbade residents from leaving. "We don't have rights and we are disturbed by the soldiers in many ways. That's why we say we have no chance to work under favourable circumstances. We don't have full rights to travel, so we can't work effectively and at the time of day we would like." Travel restrictions are most difficult for the area's poorest villagers, who do not have paddy fields of their own to work on. For these villagers, travel permits are expensive enough to wipe out income that can be earned doing wage labour or collecting fruit and other forest products. When travel restrictions began in the area in July 2009, the dog fruit season was just beginning - a time that villagers without farms rely on because they can harvest the wild fruit and sell it in nearby villages. For some, the cost of travel is now too high for the project to make economic sense. For others, curfews shorten the time they can work picking fruit or travelling to neighbouring villages. For all, the restrictions have serious livelihood implications. "They relocated villagers in 2007. Those villagers were from N--- village and they went to stay in T--- and N--- villages. They are still there, but they come back to their old homes to work. It takes about two hours to walk. During the rainy season, they have to go back by boat. During summer, they can go back on foot or by cart. The authorities are always checking their footsteps. If the villagers do something wrong they won't let them return [to their old fields] and the villagers have to pay to get a permission document from the SPDC. Three or four people can't take only one document. People have to get their own documents. The cost is 1,000 kyat [approximately US $1]. It lasts only one month." Travel restrictions are also especially difficult for villagers that have been forcibly relocated to villages in SPDC-controlled plains areas or those who have lost land due to land confiscation. In April 2006, for instance, dozens of villages were forced to move to the Htaik Htoo relocation site, Kyauk Kyi Township. 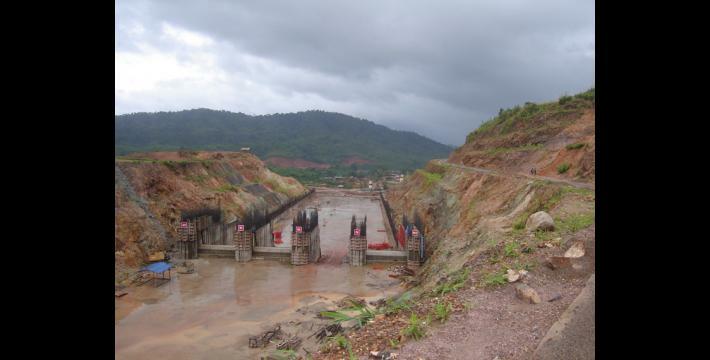 Travel restrictions are also an extra complication for villagers living north of Shwegyin Town, where the Gkyauk Ner Gha dam project has supplanted orchards and risks flooding villages along the Shwegyin River (Khay Loh Gklo). Located north of Shwegyin Town on the Shwegyin River, the Gkyauk Ner Gha dam was initially begun in 2001 with the help of a Japanese company locally referred to "Ya Ta Say." Ya Ta Say pulled out after the surveying stage, however, due to concerns about the site picked by the SPDC. Though the SPDC resumed the project alone, it is not yet complete. According to a short report by Earth Rights International, construction has included unpaid forced labour by villagers in the area. Villagers from Ler Hta Gkwee, Nya Muh Gkwe and Gk'Saw Wah Gkwee villages have already lost land and orchards to the project. Many have had difficulties replacing the property, and now mostly work as wage labourers or gather fruit and other forest products. Burma Army IB #57 and LIB #349 currently patrol the area and residents must purchase 1,000 kyat (approx. US $1) travel permits to leave their villages. As with villagers attempting to access farms far from relocation sites, villagers who lost land to the Gkyauk Ner Gha dam are now struggling to meet their livelihood demands within restricted workdays while having to purchase the right to leave home. 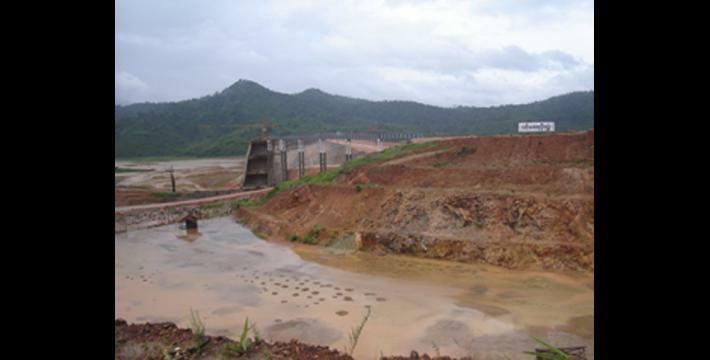 "If the SPDC dam construction didn't damage their [the villagers'] workplaces and cultivation areas, they wouldn't need to worry about they livelihoods," a KHRG researcher reported in August. "They'd have enough food for all of their family members. 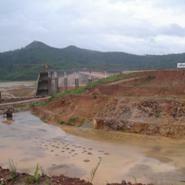 When the SPDC built the dam, the villagers lost their land and workplaces. Now they are just in the business of surviving." "The SPDC demands carts from the villagers to carry rations. When we transport the rations, we always worry that people will take the rations along the way because the SPDC never accompanies us. We go with fear, but until now this has not happened. The SPDC also demands rice from the villagers whenever their rations runs out and they demand many other things such as salt, chilli, fish paste and prawn paste. If they can't get what they want from the villagers, they demand it from the village leaders... They also demand alcohol. We have to give things to them everyday. Sometimes we don't give them things... but for our villagers not to be in trouble, we try to arrange [payment] for them." In June 2009, a Burma Army commander named Shan Nyoo ordered SPDC-controlled villages on the plains in western Mone Township to each provide two new recruits for the pyithusit ("People's Militia"). Village tracts affected by the order included Noh Ghaw, Bpa T'Lah, Weh La Taw, Thoo Gk'Bee, Aye Neh, Daw Moh, Noh Nya Thuh, Gk'Moh Eh and Gkyaw Sa Yay. Villages were also given the option to pay 180,000 kyat (approx. US $164) per recruit if no villagers willing to serve could be found. Slightly to the south, an officer from Strategic Operations Command (SOC) #2 ordered Weh Gyi village tract to provide three recruits for the pyithusit or pay 300,000 kyat (approx. US $273). Local villagers said they felt that the officer had deliberately imposed a high monetary penalty because he expected that no villagers would willingly join the militia; he was thus simply trying to extort money for himself. Not wishing to enrich the officer, at the end of June, the village made the payment by sending it to the headquarters of IB #60 in Kyauk Kyi Township, rather than to the local Burma Army officer. 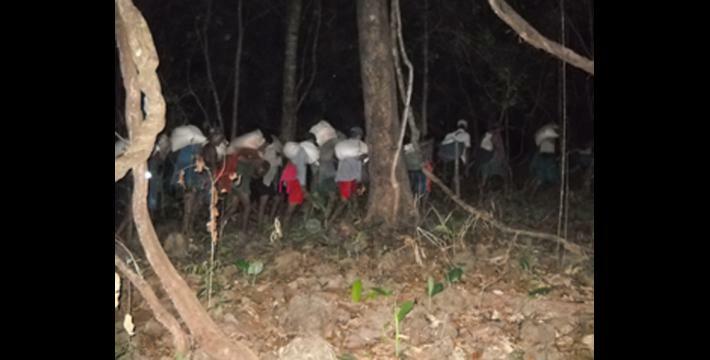 Villagers in western Mone Township also report being ordered to do forced labour and provide rations and alcohol for soldiers posted in their area. Residents of Weh La Daw and Bpa Ta Lah villages, for instance, were given until the convening of the water festival in April to provide bamboo and thatch shingles and to cut wood for a local SPDC army battalion. In an interview after the water festival, one resident also told KHRG that he and three other villagers from his area had been required to stand as guards for SPDC troops at night. "They told us to keep a fire burning for the whole night. If the fire went out [signifying that they had fallen asleep or had been attacked] they [SPDC soldiers] would fire their guns. They didn't give us anything with which protect ourselves when we were sentries. If someone had come, we couldn't have done anything." Though the SPDC has withdrawn army units from some upland areas of Nyaunglebin District since December 2008, it is important to keep in mind that this is an apparent drawdown only when compared to the high levels of militarisation from early 2006 to late 2008, when the SPDC carried out a protracted offensive against villagers in northern Karen State. As the rainy season draws to a close in 2009, Nyaunglebin is still home to large numbers of SPDC troops, troops that continue to control large areas in district's western plains and actively patrol its north and east, where large numbers of displaced people remain in hiding. Increased SPDC activity since July 2009 is creating intense difficulties for villagers in hiding who are no longer able to access their farm fields and gardens. Villagers remaining in their villages, meanwhile, have been subjected to travel restrictions and demands for forced labour that complicate their ability to meet livelihood demands. Residents of villages under more consolidated SPDC control, meanwhile, have had to contend with similar demands while also living with government development projects and an expansion of the local "people's militia." In all cases, the demands undermine villagers' attempts to support themselves - restricted access to workplaces, work time reduced by forced labour obligations and income lost to demands by the army all contribute to create precarious livelihood situations. Military Operations Command (MOC) typically consists of ten battalions. Most MOCs have three Tactical Operations Commands (TOCs) of three battalions each. A Light Infantry Division (LID) also consists of ten battalions. According to data provided by the KNLA, from January 1st to June 30th 2009, there were 29 clashes between the SPDC and KNLA 3rd Brigade in Nyaunglebin District. "Summary Report on Military Engagements in KNLA Areas," on file with KHRG. See, "Three Villagers killed and 500 new IDPs forced to flee homes as Burma Army launches attacks in Northern Karen State," Free Burma Rangers, July 9th 2009. 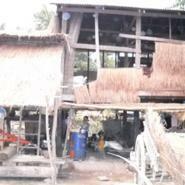 See, Food crisis: The cumulative impact of abuse in rural Burma, KHRG, April 2009. 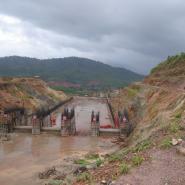 For details of forced labour during construction of the Gkyauk Ner Gha dam, see "Forced Labor on the Shwe Gin River in Burma," Earth Rights International, World Rivers Review, Volume 17, Number 4 and 5 August 2002. Though Saw L--- did not specify whom he meant by "people" taking the SPDC rations, he was likely referring to KNLA soldiers, who often target SPDC supplies. 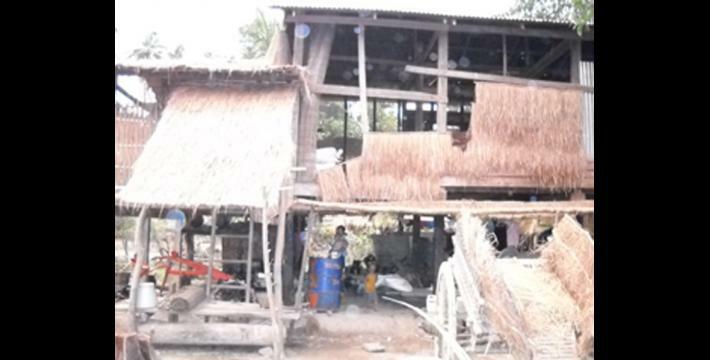 In Dooplaya District to the south, for instance, during February 2009 villagers were forced to pay large sums of money after rations they had been forced to transport were seized by KNLA 6th Brigade. According to the Independent Mon News Agency (IMNA), the total compensation demanded exceeded US $8,000, precipitating a fatal heart attack in a local village leader. 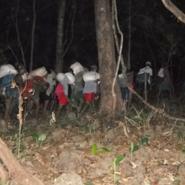 See, "Villagers forced to compensate army for rations lost in raid by Karen rebels," IMNA, February 2009.